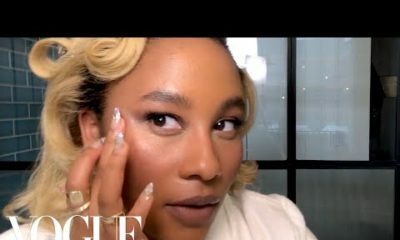 It’s the holiday season, and fab makeup & hairstyles are rolling in that would be perfect for all the events you have lined up. 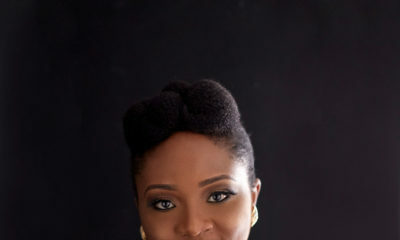 Today, we are checking out fabulous hair by Nigerian beauty vlogger, Ronke Raji. 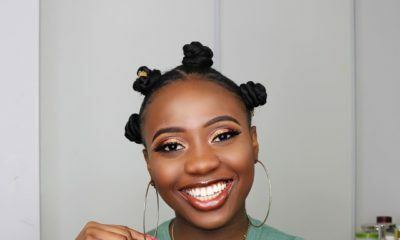 Ronke not only inspires us with her amazing photography and makeup skills, but also rocks her natural hair giving us inspiration along the way. So what does she have for us today? 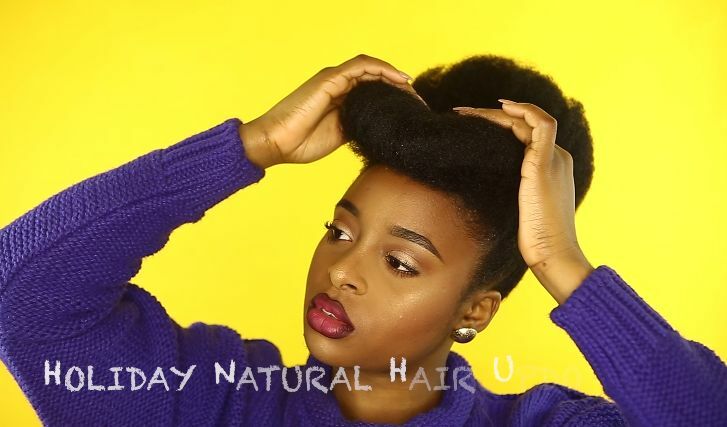 A fun and easy natural hair holiday style that doubles as a great protective hairstyle. The look features a puffy up-do, and a retro roll towards her forehead. Easy, laid back and fab! what are you vomiting? this post doesn’t warrant this nonsense. looks like you lack sense or need approval. I’m natural, very sweet natural. but wtf z all this hype about natural hair??? I’m tired of it … I’ve been init for long anyway. and I’m stepping out b4 2016. what nonsense! nothing special…. Are you the only one allowed to cough up your opinion here. This is a public blog not your lonely planet facebook page. It’s a blog people are allowed to air their opinion. You sound bitter and twisted and it will take more than just a hair style change to lift your mood. Prehaps its that time of the month or the absence of it. Anyway you might want to try HRT or even a nice man. KMT. If your hair can pack in”shuku”,even if it is just a little one, then take an extension,preferably a clean old one(recycle), pack a fist full depending on how big or small you want it. Tie one end wit a rubber band or elastic,wrap around the end of your “shuku”, remember to wrap it tight,when you’re done use Bobby pins to keep it in place. Use gel and brush flyaways. If your hair cannot pack “shuku”, take the extension and braid it individual varying in size, wrap around your hair,it would look like a hair accessory, and a safety pin to hold it in place. Remember you can mix colours and textures as you please. To order you aloe vera,oils, and butters plus glycerin and black soap scrub and so much more at affordable prices , contact -2BE1CC2A , 08166243282.. Dairy of a naija mom. Obviously a well maintained looking hair. Dark and shiney. I put a little texturizer on my hair for just 5 mins though it still has the natural look but sure regret it. am going to cut it and start all over again. 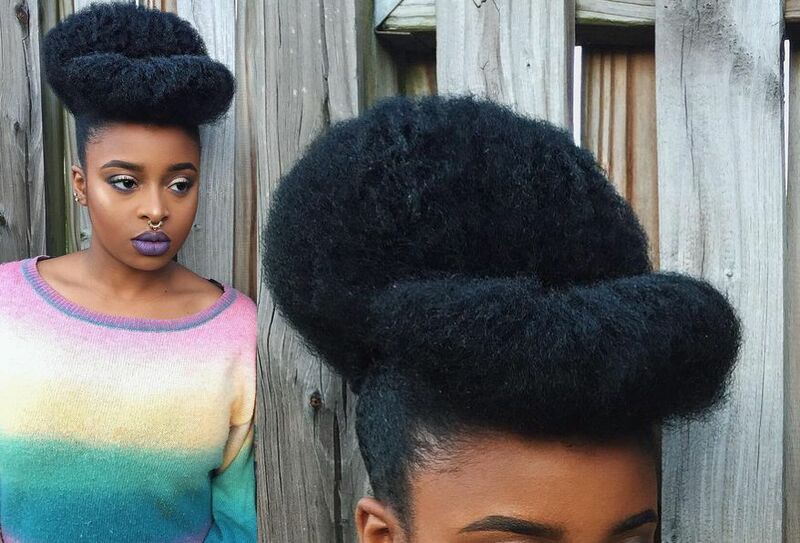 Natural hair sure needs inspiration and Ronke just inspired me. @ thanks to Ronke Raji. lovely hair.